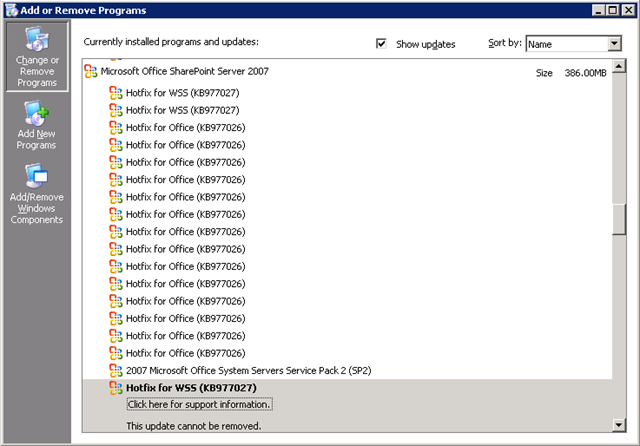 SharePoint (MOSS) Version After Application of Office Cumulative Update for December 2009 | Are you a user? I love it when I get to go back to and old blog post and use it myself! I just finished applying the December 15, 2009 cumulative update to a MOSS virtual server. After application, the version is 12.0.0.6524. I’m sure that Penny Coventry will be updating her web site with this information shortly. Here are some handy links. Hey, has anyone noticed that the version reported in SharePoint Central Administration is 12.0.0.6524 and the version referenced in KB977026 is 12.0.6524.5001? Is this correct? Are the two version numbers supposed to match? Seems a little confusing to me!